In Spring 2015 we offered up to 30 NERC-funded postgraduate researchers (through the CENTA DTP), supervisors, and early-career researchers the opportunity to work on developing productive partnerships with the end-users of their environmental research, and to communicate the economic and social significance of their work. Over the five days of this course NERC-funded researchers worked with me and Dr Clare Warren to explore conceptual issues, including: who are the end-users for your research, who could they be, and how do you best present your work in the public sphere to encourage end-users to work with you? The researchers also developed and practiced new skills under the supervision of Dr Janet Sumner, Gerard Giorgi-Coll and Thomas Ryan, such as working with recording equipment, producing pieces-to-camera & editing footage. What follows is a description of the first of three five-day workshops, which took place in January 2015. 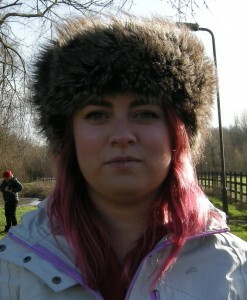 The post has been authored by Clare Lawson, Jonathan Moles, Bethan Parkes, Alan Radbourne and Kerry Reid. The post includes links to some of the videos the researchers produced. If you’d like to view the other videos you’ll find the all here. Each participant produced a 250-word summary of their research, suitable for one or more end-users of this research. The researchers could define the audience for this summary if they had a specific group of end-users in mind, or they could provide a summary for general audience. They were asked to cover the aims and objectives of their research; how they were planning to achieve them and with who, what, when and where; and to describe the likely or potential outcomes of the work and how it could be used? Exploring the end-users of your research. Credit: NCCPE. The researchers were also asked to send through a list of the end-users of their research and how they might contribute at different stages of the research cycle. We provided two slides, produced by the NCCPE to support this activity. If the researchers didn’t have a list of current end users, we asked them to list as many different groups as they could, thinking about who might be interested in working with them in some capacity. We collated and circulated the responses to these two activities in advance of the workshop and used them on Day 1 as the basis of an initial discussion about the requirements for researchers to generate evidence of social and economic impact. Monday, the first day of our week of training in engaged research and communication! The day started with a discussion with Richard Holliman and Clare Warren, about our research summaries, end users and the wider research impact agenda. We were also given folders with information for use throughout the week and into the future when we’ll come to write plans for generating impact from our research. 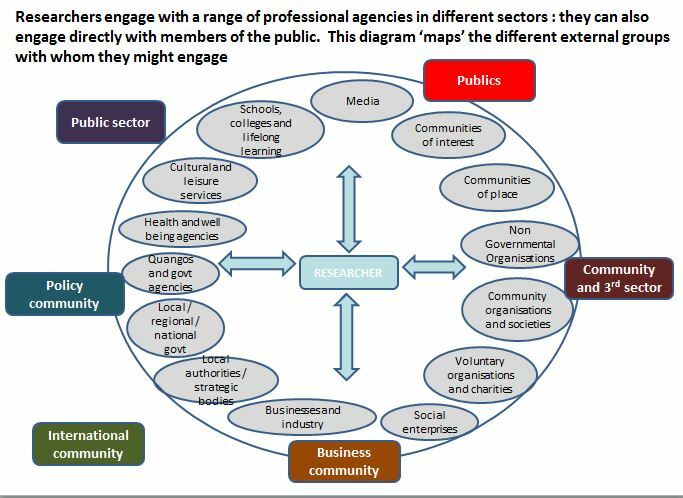 We explored why engaging members of the public, communities and other agencies with our research is important and how to go about doing it. We then went to meet the camera operator, editor and producers of the films we were going to make during the course of the week. Our first piece of filming was being interviewed. I think we were all apprehensive about being filmed. Tops tips from Janet Sumner were to look animated, smile for the camera and not to use scientific jargon! We were all filmed in an interview situation about who we are, what we do, why we do what we do and the significance of our research and why is it important to the audience. 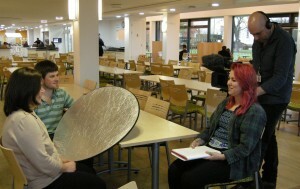 Clare being interviewed by Kerry with Jonathan holding the reflector and Gerard on camera. 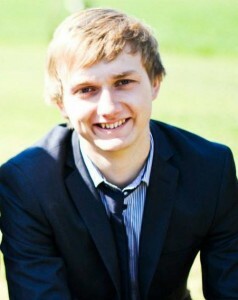 The hardest part for me was to ignore the camera and not to look straight at it, as you look really shifty if you do. Hesitation, the use of jargon and repeating the same word again and again were common errors and several attempts were needed by all of us. We then all had the chance to be critics and review our interviews in the editing suite. It was a little unnerving but our most severe critic was ourselves! Later on, we also had a chance to be the interviewer as well as the interviewee. This was more difficult than it sounds. Top tips were to ask open-ended questions, leave pauses between questions and answers to allow for editing and ask exactly the same question for retakes. This all felt very unnatural compared to the normal conversations we have over a cup of coffee. Select the video of my interview below if you’d like to take a look. In preparation for day two, we were sent home to write and learn a script for our second piece of filming our piece to camera. Adapting the research summaries we’d produced prior to the workshop, our script would allow us to talk directly to our selected audience about our research and its impact on wider society. Tuesday was all about using the scripts we’d developed overnight to produce ‘pieces to camera’. Unlike the interviews, the presenter of a piece to camera communicates directly to their selected audience. This gave us the opportunity to talk about the significance of the research we do, explaining why we think our research is important in terms of its social and economic impacts. The first task was to make sure that our scripts would be understood by our selected audience, in my case members of the general public. Our aim was to present a video which wouldn’t be complete gobbledygook to the average 14 year old: no jargon, no needlessly complicated descriptions of scientific methods; just the key message of our research and its significance in wider society. Putting this into practice can be more difficult that it sounds, in part because we some of us were so used to discussing our research solely with other scientists. As soon as our scripts were complete, we started pacing about, trying to memorise our lines. We filmed the pieces to camera out in the park. This gave natural light to the videos, but introduced random sounds (e.g. planes flying overhead) that could ruin a take. We used some simple techniques to add a bit of action, such as walking out of shot at the end of the video. Rather than standing awkwardly in the middle of a field, we walked while we talked. This added its own problems, as Gerard the camera operator had to walk backwards while filming, and we had to concentrate on walking slowly without moving our heads around too much. Meanwhile, we had to maintain eye contact with the camera, in order to address our audience without looking distracted. For me, doing all these things at once whilst trying to remember what I wanted to say was difficult enough. It took several attempts just to get to the end of the script. In the end I felt like I neglected the most important ingredient: enthusiasm. Nevertheless, each of us ended up with a short, informative video about our research, and we had gained the skills we needed for presenting more films later in the week. You can judge my performance by watching the video below. At the end of the day we were given our next pieces of homework: to review a blog post outlining the prospects for postgraduate research in 2033; and to start planning to produce two films about the social and economic significance of our research. Wednesday was the third day of the workshop, and it was the first day of the week where we didn’t have to do anything in front of the camera. What a relief! Having been grilled in the interviews on Monday, followed by rehearsing our pieces to camera and filming them on Tuesday, I think it’s safe to say that we were all feeling quite exhausted, so it was nice to have a bit of a break from the camera! However, there was no time for a rest, because we had another very busy day. We began by casting our votes on whether we saw the prospects of ‘An engaging thesis’ in 2033 as something we would be willing to support. Following the vote – 3-2 in favour – we discussed our reasoning behind our decisions. We also had an opportunity to review a Pathways to Impact plan from a previous grant application to NERC. We were given a proforma produced by the NCCPE to work with covering five areas, scoring each out 20. We totaled up our scores out of 100 and also made a decision about whether the plan was fundable. Needless to say the discussion that followed proved to be very interesting. The next the focus for the day was getting our storyboards and scripts sorted for the two films, ready for being back in front of the camera on Thursday. In the morning, we assembled in our two groups: exploring the significance of ‘carbon’ and ‘volcanoes’, respectively. Our first challenge was to go searching for willing volunteers to be interviewed the next day, and to track down some props to help us explain things effectively. We managed to sort ourselves out with a model volcano and some volcanic ash, to help make our explanations easier. Once these were ready, we also had to come up with a running order for the next day, and one of the most important parts of this was working out exactly where we would be filming each scene. It would be really important for us to make sure that there was a link, however tenuous, between the content of what we were filming, and the environment we were filming it in. This proved to be quite a challenge for the volcanoes; cue special effects from Gerard (see the video below). It’s this sort of behind the scenes preparation that you just don’t appreciate enough as a viewer! Once these were decided, we worked on refining the script, making sure it informative, fun and understandable; so not too much to ask for! This part really made me realise how important it is to get the right words in the right order, to make sure that what you are trying to say is exactly what the audience will be taking in. We also noticed how different things can sound when they are spoken out loud compared to reading them on paper. Although we didn’t even think about touching a camera for the whole day, I think the effort we put in to preparing our scripts, storyboards and props was really important. And with that finished, we could all go home and relax for the evening before the filming started…well those of us who were not presenting the next day could. Alan and Kerry spent their evening rehearsing everything to perfection to be ready. After a quick run through the storyboards to confirm the day aims we were off out to our first shoot location. It was cold, very cold! 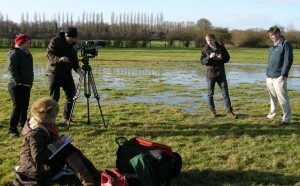 The carbon-focused video was the first to be filmed with a guest interview in a flooded field. We had to shoot this from a couple of angles to film ‘noddies’, where the back of the interviewer’s is slightly in shot to show they are still there and interested in the conversation. Watch out for the over enthusiastic nods the next time you watch any interview on television. One of the tricks with filming is to know what you are trying to say and stick to it. No ad-libbing is allowed or it just will not flow and the editing process will be a nightmare. Next we filmed numerous pieces to camera to provide continuity between interviews. These require a good memory to present the same lines over and over until a perfect take is captured in between planes flying overhead and dog walkers looking awkward in the back of a shot. Finally, we added a cameo appearance from Janet as an amateur bird-watcher being interviewed about the changes to her local lake ecosystem, closing with a closing piece to camera bringing the first film to a wrap. During the filming of the first video the second group had been busy learning their lines and acting as runners for tea to keep everyone warm on what was quite a crisp winter day. Just before lunch it was their turn to step up and get in front of camera. Interviews and pieces to camera took on some more challenging filming locations, including the top of a building just as the wind picked up to what felt like gale force strength. The filming then reached a conclusion with a final piece to camera as Kerry negotiated automatic opening doors under the pressure of the rapidly setting sun. Thankfully, the final piece of the jigsaw was completed bringing the filming to a wrap. The day was a fascinating insight into the difficult and exhausting world of filming and media production. With the sun setting we were ready to head home and relax, knowing we didn’t need to spend the evening learning lines or thinking about what to wear the next day ready for being on camera. This was the last day of the training and it was a chance for us to reflect on what skills we had gained from the workshop and how we can use them to enhance our CVs. We spent time discussing the Public Engagement lens on the Vitae Researcher Development Framework and how engaging with end users and the public is part of the professional development of researchers. This morning session allowed us to think our way through what had been useful during the course, and what challenges we had faced as researchers going forwards. We all agreed that one of the most challenging tasks had been to fight the urge to throw in scientific jargon and bombard people with unnecessary facts. In effect, we had been trying to find our ‘public’ voice as researchers, stripping it back to basics and answering questions that people care about, primarily why are we doing this and who is going to benefit from this research? I like the fact that this course challenged me to present and explain my research to a range of audiences, as it gave me a moment to step back and think about the importance of my research and who is actually going to benefit from my work. We then focused on how this course relates to the Researcher Development Framework (RDF). The framework is divided into four domains, with one dedicated to Engagement, Influence and Impact; primarily concentrating on the knowledge and skills to work with end-users to facilitate wider impacts from research. We spoke about the benefits of researchers engaging with stakeholders, end-users and members of the public and how engagement can improve the quality and impact of our research and develop skills which can enhance future employment and promotion aspects. And we also discussed the need for effective public profiles for researchers who want to engage with different stakeholders. Some really interesting topics were raised and we had a chance to look over the RDF and talk about past experiences and opportunities we have taken part in and how they could enhance our profiles, emphasising the importance of a researcher who can address different audiences and communicate with a range of stakeholders. In the afternoon we were given the chance to watch the videos that had been produced over the week. You can watch the ‘volcanoes’ video above (see Day 4). The ‘carbon’ film is below. I think it is fair to say we had made some pretty impressive transformations on screen! At the start of the week we were given the task to film interviews and pieces to camera just as a general introduction to our research topic. I found my videos difficult to watch. It felt at the time that I was fairly awkward, stumbling through my lines. 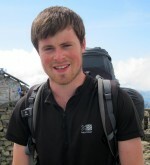 However, when I watched the final videos we had produced, one of which I had been presenting, I was really pleased by the improvements we had made in our confidence in front of the camera and the ability to present and talk about scientific processes in a much more simple and enjoyable manner. I am really pleased I was given the opportunity to take part in this course. It was a great and challenging experience. It also made me realise that presenting in this style was something I really enjoyed and would like to continue, something I definitely wasn’t expecting to come from this. I would like to thank the organisers for helping us out as I speak on behalf of the whole group when I say it was a really enjoyable and rewarding experience. The workshops were funded by NERC through an Innovation Award: NE/L002493/1, and as part of the CENTA Doctoral Training Partnership. 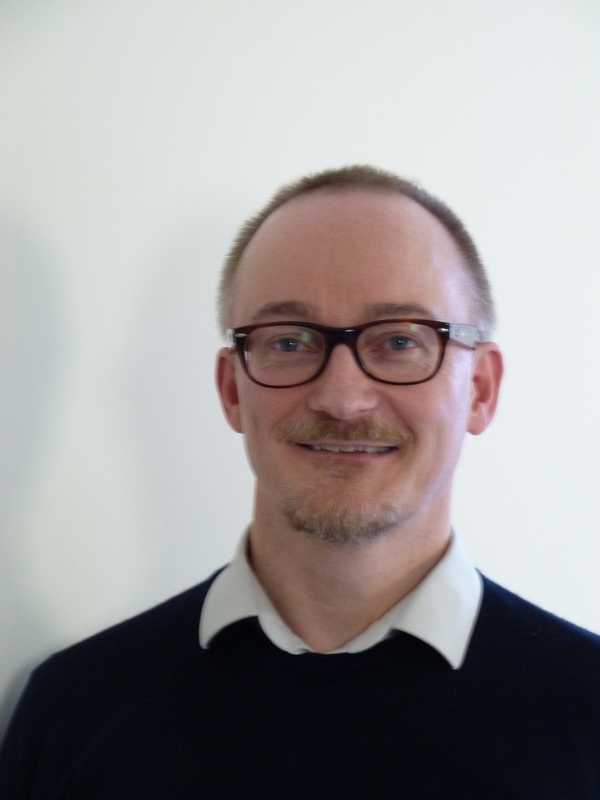 We’re grateful for the support of Dr James Bendle (Birmingham University), David Roberts (NERC), Sara Kinahan (Birmingham University), Diane Ford (The Open University) and Liz Lomas (The Open University). This entry was posted in Communication, Training and tagged CENTA, culture change, Digital engagement, engaging research, Media, NERC, postgraduate research, science communication, Web video on Wednesday, 6 May 2015 by Richard Holliman.